Men on horseback galloped toward the calf, twirling lassos to capture the calf as they jumped down and tied it hoof to hoof in preparation for branding. 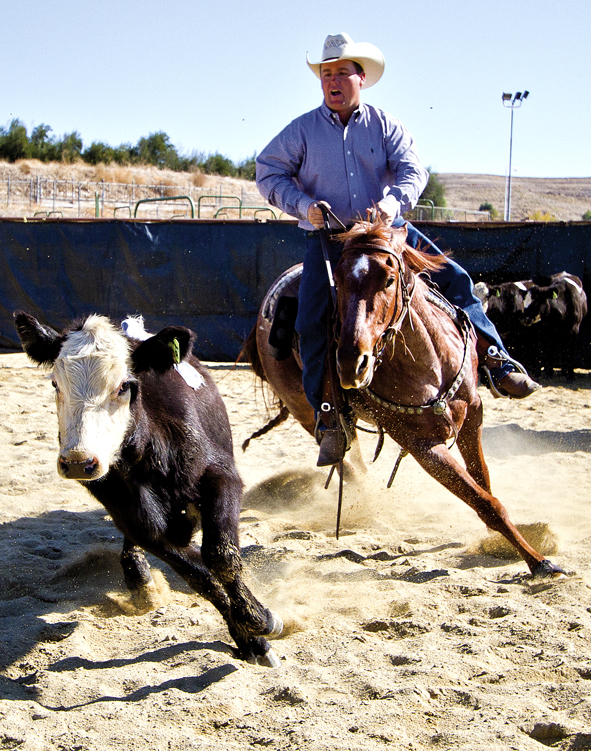 Ranch sorting is a sport that came from the time when farmers needed to separate cattle in order to transport, brand, or perform needed medical activities on the calves. A team of two, riding on horses, try to sort 10 cattle in as little time as possible from one pen in to another. The team with the fastest time wins the competition, but there are rules the contestants must follow. The idea came from tasks that needed to be performed during calving season, according to Tom Fafard, a history major and Equestrian Center student at Pierce. “When it was time to round up all of calves together, they would be branded, given their shots and other medical exams, and if necessary are castrated,” said Fafard. The two-day event was hosted by the Equestrian Center and supported by the Boots and Saddle club and attended by national champion James Greer. “I tried it for the first time last week and it was also the first time my horse had seen cows,” said McInerney. Students had the opportunity to rent a horse to use for the clinic or competition, or bring their own horse. For those who brought their own horses, the Equestrian Center offered them overnight boarding. The clinic culminated with a barbeque for all the attendees. The winning team received a first place belt buckle as their prize and the winner of the Kellogg competition won a new saddle for their horse. All money raised will go to the Equestrian Center, the Boots and Saddle club and the equine scholarship program.